Here we have a list of dive sites in the south section of Pembrokeshire, from St Brides Bay down to Castlemartin. We are adding to this list and update often and updated weekly. An area of rocks and some small caves, which are home to a few very large lobsters. One cave can be entered for quite a way in, and there is an exit to the left.Not very deep, max. is only 10 metres and away from the rocks there is only sand. Here we have seen five feet lobsters! Just out of Little Haven before you reach Hen & Chicks there are some interesting cave formations which can be swum through. An area well worth exploring, with visibility unusually very good. The area around here has been searched for the Wellington Bomber which went down during the war, reports of sightings have been made. A local fisherman brought up a wheel from the plane in May 1999 when he was netting the area. We will be conducting searches of the area during weekends, if you wish to take part then please contact Len on 01437 781117. We can see Broad Haven in the background on the left of Ticklers Point. Here we have the home of many large Lobsters, some 5 feet long have been seen in the area. Tide flows east LW plus 45 mins for 3 hours and then west LW plus 3 hrs 45 mins for 9 hours. Launch out of Little Haven or Broad Haven. About twenty minutes away SW are the rocks, Stacks and the Hen & Chicks. Stacks are the larger and the furthest out to sea. These rocks contain some of the prettiest diving in the area, and are the most frequently dived areas around here. Seals are often seen around the rocks . These rocks are also home to Trigger fish in the warmer months, very colorful fish blue and yellow. Fish often seen are the Butterfish, colorful Wrasse, Pollack, Mackerel, Dogfish, and Cuckoo Wrasse. There are Spider Crabs, Squat Lobsters, Lobsters, Edible Crabs, Velvet Crabs, and the Hermit Crab. The rocks are abound with Dead Mans Fingers, Sea Urchins, Peacock Worms, Plumose Anemones of all colours, Jewel Anemone, Dahlia Anemone, Sea Fans. The rocks head out westward from the Island, and average depth around 20 m. The reef drops down to sand where you will find Scallops. The best diving is to the North and West of the Island. Stack rocks are sheltered from the S S/W winds diving to the North. Completely sheltered from S, E and SE winds. One of the most popular dives in Pembrokeshire, easy to get to, near to the coast, plenty to see, and one of the most beautiful areas around. Dive to the West of the rock. The south side is usually not good. The reef runs out from the rock to the west where it drops down to 30m. Where do you start with such variety, depths from 10m to 30m, all excellent diving; we hope to be able to buoy some areas this season to make life a little easier. First start at the east end (13m) which is mostly sandy, the tide can run a bit here so stay close to the bottom and head for the rocks and kelp on the north side and work your way along westerly, here there is mostly boulders below the kelp line, plenty of fish life. Half way along (16m) mainly Island coves and large boulders with openings between, here you might see the seals and many dogfish. Move on westerly where small boulders shelve and then these a roof dropping out to your right out to about 20 m then onto the sand. You will see plenty of small sharks out here about four inches long as well as pipe fish, crabs, large lobsters at the end of the reef as it drops down to over 30m. If you go to the left (south) there are large and small gullies, here you will get a good run through with the swell, or go northish and down along the rock face to sand and the side of the reef, you are about 18-22m depending whether you are up or down on one of the many gullies. If you keep on there are loads of smaller bits and pieces off the main reef properly down to about 28 m now with steep inclines heading back up. There is plenty of life on the side of the reef, watch out if its running or you will be over the reef before you know it and playing in the sand on the other side. Just tuck in and keep low if this happens and work your way around between the gullies. At the end of the reef there are really large gullies and separate pieces of the reef (30m), have a good look round, its really nice out here. 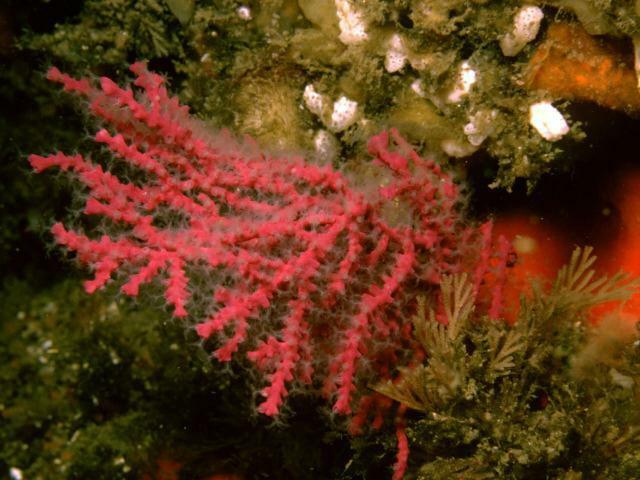 I`ve found rose coral, sea fans on the overhangs and these plenty of the smaller stuff, nudibranchs, anemones, plumose and carpets of dead mans fingers. We have found out here the odd six foot shark! but it would not fit into the bag! 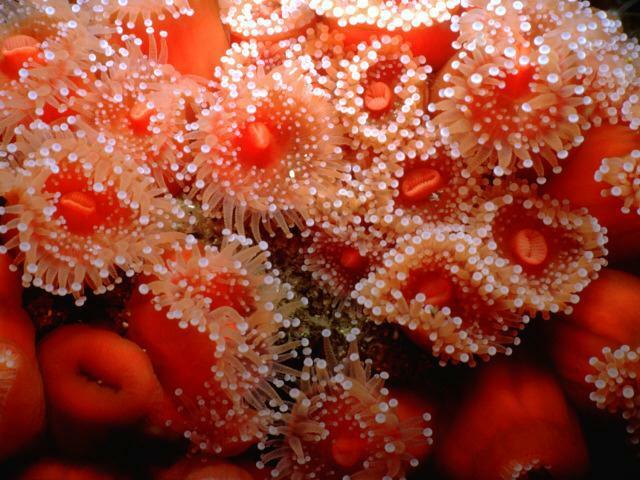 You will find jewel anemones in abundance and enough fish to keep Harry Ramsdenns going forever. If you travel up and over the top of the reef back easterly from the end, you will find large drop offs which seem to go forever. Work your way up to the top and you will find yourself at a large pinnacle which is covered in red jewel anemones which rises to within 9m of the surface. Just below you will see a slash in the rock and a long blue back fin from a large conger, there are many large congers on the reef, so watch your fingers when you put them down them holes. You can dive stacks whether it blows north or south as you are usually sure of a lee side, go for depth if there is a big swell. On the other side of the stacks, south facing (11m) you will find much the same at the start with more of a wall at the east end and a few small coves, or go along the kelp and boulders down to small rocks and shale, sometimes carpets of brittle stars. Going out further (20m) and you will find the side of the reef not quite as good as the other side, plenty of fish life. Have a wander to the end of the reef up and down the gullies and work you way to the end of the reef to about 30m. You can dive here for a week and only see a part of the large reef as it seems to go on for ever, but be aware of the current especially on the springs. St Brides Bay. Shore Dive. Shore dive, and can be very pretty around to the right. Lots of little gullies and holes to pock your head in. Fish life is very good among the kelp. Depths reach up to 10m, around to the right, but further out drop down to 20m. An excellent dive for the Novice. Ideal time to dive would be at high tide. A sandy bottom stretches out of the bay. Surge can be heavy especially with a westerly blowing. A nice area for the children to play, and for a picnic lunch of BBQ after a dive. A wonderful dive, very pretty, a smaller version if you like of Stack Rocks. Really the same type of diving as Stacks, but depths go to around 10m only. Just as pretty, and ideal dive for the Novice diver. You can dive in between the rocks to the other side, with a few large gullies to swim through. Very pretty, and have dived with vis around 12m. 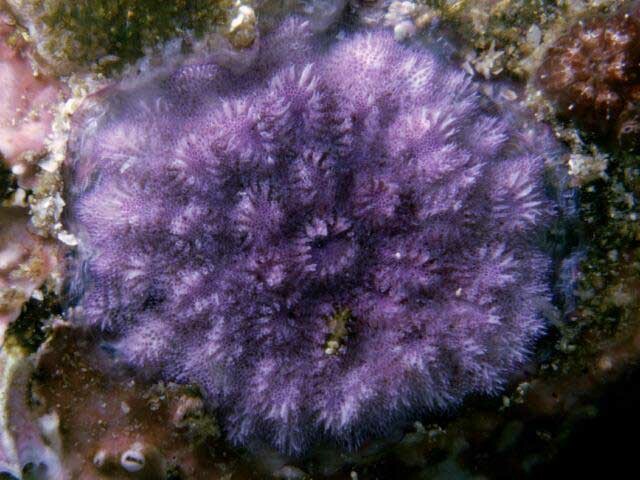 There is a Plumo garden near, covering most of the reef. Another small reef lies out towards Stack rocks, and that is covered with orange dead mans fingers. 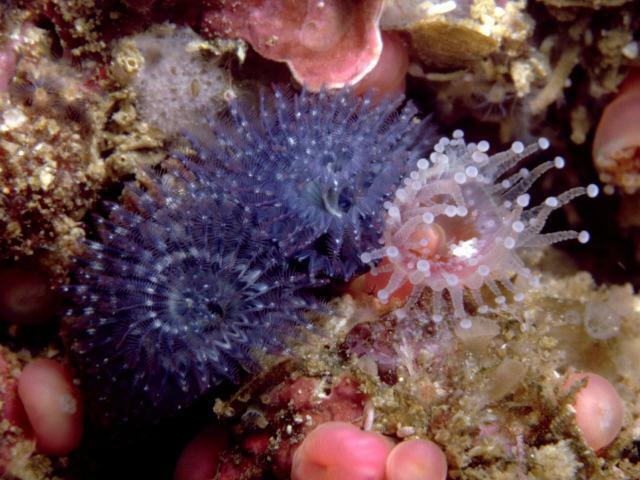 There is so much life on this reef, that it is one of the best dives in the area for marine life. The Trigger fish have made this place their home for the summer months, where thousands are seen. They meet up in large numbers at the end of October where they must leave to warmer waters. Hen & Chicks. 8 15 meters. Rocky outcrop about 2 miles due west of Little haven. Got to be one of the best dives in the area. Drop in on the eastern side of the rocks near the cliff's, where you land on sand at 8 meters., Heading west you come to the rocks at the base of the “Chicks”, wonder in and up the gullies, look in the nooks and crannies there's so much life in the there from sea cucumbers to prawns, lobster, crabs. Look at the walls as you travel almost due north out to the reef, its full of different coloured jewel anemones look in between the rocks to find nudibranchs. You will find Trigger fish from the beginning of September in large shoals, or sleeping it off in the many of the small gullies. Travel out and through the many gullies on your left and look around, don’t go in a circle, keep heading north and just follow the reef out. There can be a bit of a run on the west side of the reef for about 100 feet or so, but it drops off as you turn back in to your right. You will find sea hares here (look for the tea bags with ears) Follow out on the reef, the place is alive with spider crabs, look closely and you will find pipe fish, nudibranchs, sea spiders all on the kelp, and numerous types of anemones, some like tea plates. 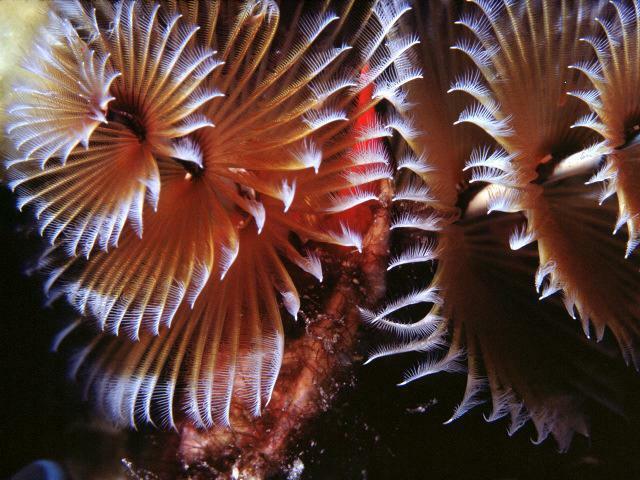 When you get to the end of the reef you will find the over hangs with the plumose garden. Reds, greens and whites, you will be amazed at this spectacular sight, its gives a buzz every time. (15m) Head back now roughly south pass the large gully on your left full of large wrasse and go through the shoals of pollack. Keep the gullies and rocks on your right as you travel back, keep going and you will arrive back at the rocks and sand, or go through the large gully on your right, where there are plenty of places to pear into as you go along. About two thirds of the way along, there is a large rock on your right, go up and you will find the trigger fish on your right. Drop down and go left follow on and take the next gully left, just past many large boulders with dahlia anemone in sight, just after the small cave on the left follow up and go with the flow, hang on and then go along between the kelp, the sand on your left where you first dropped in. Watch out for the playful seal creeping up behind you. Hope you enjoyed your dive! NW out of St Brides Bay. An area of rock and gullies rising up to 10m from 35m. Plenty to explore, with lots of drop offs and gullies, some of which are enclosed. An area around is sandy and home for hundreds of Dogfish. 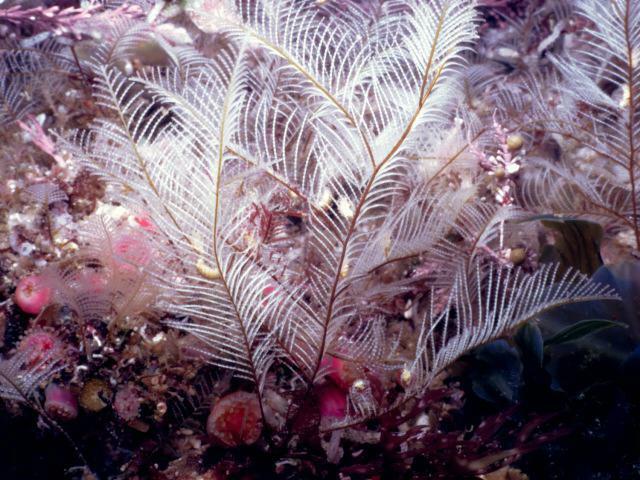 Scallops are found westwards at 35m. Launch out of Little Haven or St Brides Bay. 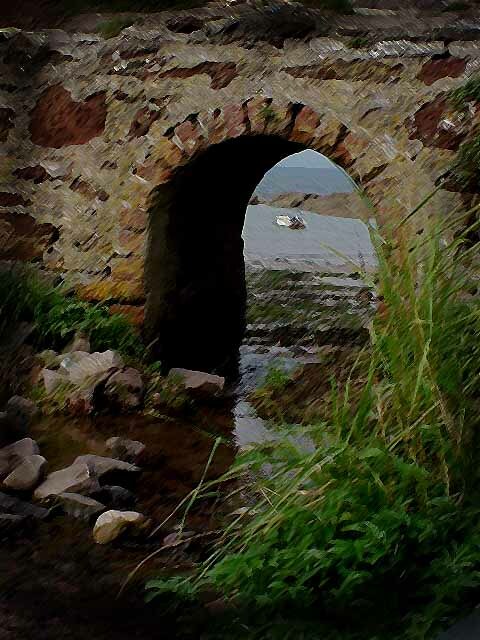 An area inside St Brides Bay where there are some large walls and drop offs. We have the marks for the site and is dived only by us. There is some wreckage about which we are still exploring. A secluded rocky little cove, sheltered from the southerly winds. A very good shore dive, with depths going down to 20m. The beach can be reached via a concrete track down from the car park. The rocks can be quite slippery, and care must be taken at low water. Cars however must be parked at the top of the hill in the NT car park. This is also the launching site for the Dale Princess which takes passengers over to Skomer Island, and gets quite busy in the summer. When shore diving stay over to the right hand side of the bay. Toilets are near, and the home of the Skomer reserve is situated in a building on the way down to the cove. A shop selling NT goods, and details of Skomer are sold at the top near the car park. On the left hand corner of the bay the sides drop to over 20 metres where you will find a wall. Here you will find much marine life covering the wall. On the right hand side there is another wall dropping to around 15 metres, just as pretty as the other wall but with more fish. 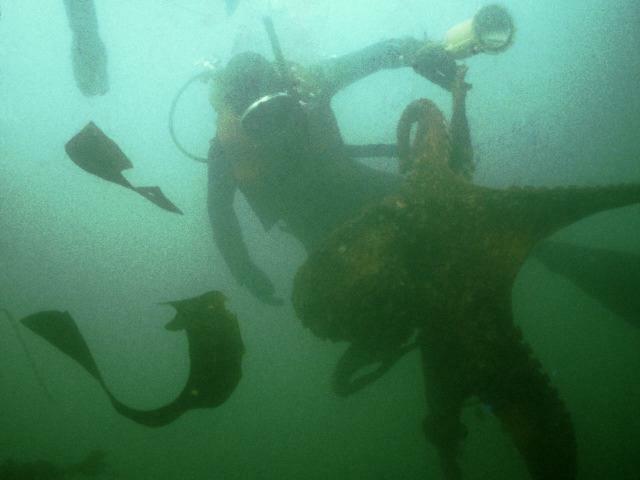 Large spider crabs can be seen in the kelp as you swim out to the corners of the bay. Around the corner from Martins Haven is a wall that drops from 7 meters. to 30 meters. It is one of the best walls in the area. We discovered it recently, and dived it for the first time with a Japanese friend called Junkos. It was her birthday that day, and she thought nobody new about it, that was until she got back to the boat to the sound of "Happy Birthday" being sung. Slack is one hour after HW till LW. Stay with the reef and beware of the current running sometimes west. A small reef just to the west of Martins Haven, drop in on the top of the reef where you will find boulders, kelp and small channels in the rocks. Good Nudibranches country and plenty of fish life, wrasse, pollack together with vast shoals of mackerel on the wall at times, also crabs and lobsters. Drop in to the west of the reef where you will find it goes down to 15 meters., There are some lobster gullies to your left, go right and you will find yourself dropping down past all the Jewel annenomies, large annenomies, nudibraches. You will find at the bottom of the drop some large boulders with the bottom still dropping away, follow on and you will come to these large rocks, where there is always a large 4 lb. lobster to be seen under the furthest out at 21 meters. Continue dropping till you reach 26 meters. on the sand. To your left (south) drops away even further to about 40 meters., where you never seen sand so steep. Follow on and continue around the reef and you will find a couple of large indents on your right, go inside and up and down and have a good look. It is teaming with fish, look for the brown horns they are always in attendance, together with lobsters and crabs.. Drop back down and you will be on the scallop bed, not that easy to spot, but you will see the tendrills, or even one flying past you! The depth you will find starts to decrease and a bit if a run against you from the east. Rise up and travel along the side of the reef, where there are a few small gullies and cracks in the reef, here you will find squat lobsters, Cray's, cotton spinner and lobsters. Follow on and come to the rocks on the south of the reef, flat out at 13 meters., follow around and you will come back to the gullies which you saw on your left as you descended. You got plenty of bottom time so travel around the front of the reef at about 16 meters. and you will find plenty of life to look at on the overhang, such as white and orange dead mans fingers. When ready pop back up to the top of the reef and find the anchor and up to the waiting boat. Be aware of the current if you drop away from the reef, especially if its raveling southwards towards jack Sound, not a recommended drift dive! The bottom of the sea are lined with very large boulders, which give home to the Lobsters. Depths are around 15 m and care must be taken with fishing line, as the fishermen use this area often. 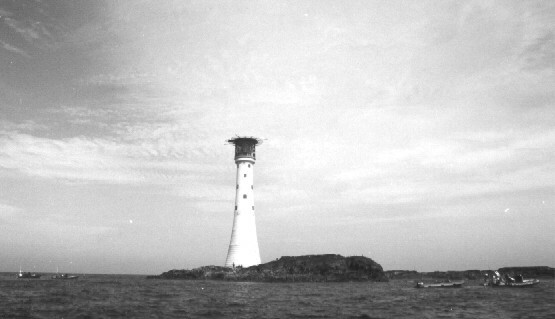 In 1996 a 14lb Lobster was seen by the Fishguard Diving Club. It was 5 feet long. A nice area to explore, tides are weak under the cliffs. The second small bay around from Martins Haven, heading east, there are some interesting gullies and small caves under the kelp at 8 meters. The area drops down to 20m, with a ridge running down from the bay seaward. The area of sand has a small Scallop bed. The area is protected, as it is in the Skomer reserve, and must not be touched. We have seen Sun Fish swimming along this point, and while I was watching them swim past the boat, they spotted the divers bubbles, diverted their path to decent down the bubbles! When the divers came up they said they saw two fins swim past them!! Here you will also get the chance of seeing octopus at about 15 metres. A nature reserve, home to Kittiwakes, Fulmars, Manx Shearwaters (160,000 pairs), Razorbills, Guillemots, Puffins, Oystercatchers, Shag, Cormorant, Herring Gull, Lesser Black Backed Gulls, Grey Seals, Dolphins, Sun Fish and much more. Underwater there are Sea Gooseberries, Little Pinks on cave roofs (quite rare), Sea Grass, Yellow Trumpets, Devonshire Cup Corals, Scarlet and Gold Star Coral, very rare, found on the south side of Skomer.There is so much life on and around the Island, that's not to be missed, a journey across this wonderland is a must. There are many dive sites around Skomer itself, these are listed below. The most often dived is the North Wall, Rye Rocks and the Lucy, these are to be found on the north side of the Island. 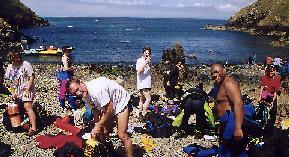 There are other dive sites on the west coast that can be dived when the weather is good. This coast is quite tidal and slacks should be chosen. West from the Lucy lies the North Wall of Skomer. The wall drops down steadily to 40m a pleasant dive, as much life on the wall as there is at Stack Rocks. Some large drop offs which are quite spectacular. The bottom slops away at a 45 degree angle, which can be quite disorientating. Octopus are seen nearer the bottom. Start on the corner of North Haven at 6 meters. and head northwards along the wall. Keep close to the rocks, and make sure you descend close to them, where you might be lucky enough to have a Seal swim with you.There are six different types of Nudibranches to be found, some seen only on the North Wall. The best place to start the wall dive is just out of North Haven on the corner. Here the depth is 6 meters and by swimming around the corner following the rocks out, the wall drops straight down to over 40 meters. Swim to the right and follow the sand bed at about 12 meters you will find another wall that is also as good. You are not far from where the wreck of the Lucy lies. Lies to the Northern point of Skomer Island. Tides can be quite fast, so picking slack is a must. The rock drops down to 20m one side and 40m the other. Slack is 2 hours after HW Milford Haven. Stay close into the wall facing north and descend along the wall, here the current is less, move away from the wall and the current picks up.This must be dived with care, as the tides can take you out to sea, and many a diver has been lost diving along this corner of Skomer Island. The best time to dive is at neap tides. SW of the Garland Stone. 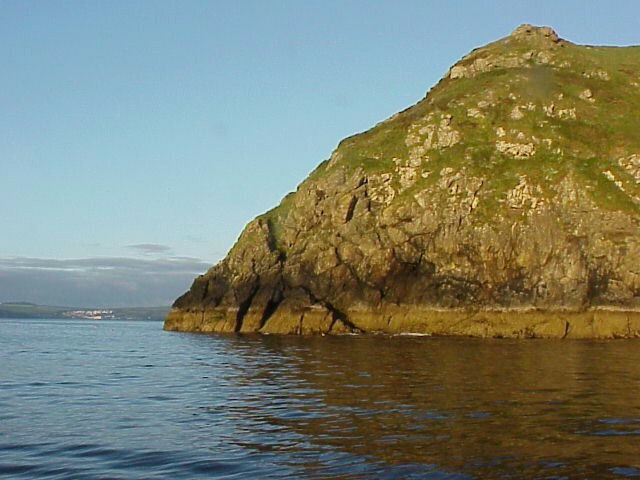 A rock rising from 30m to the surface. An interesting dive. Well sheltered from S, SE and E winds. Here you will find some large sea fans and some very large fish. A vertical drop off from 6m down to 40m. A spectacular drop. The tides can be quite severe, so care must be taken. There can be quite a swell coming in from the Atlantic when there is a low pressure out there. To the SE of the Lucy lies Rye Rocks. An area of rocks out of North Haven. An pretty little area which starts at 6m then swimming northwards drops off down to 40m. The Lucy could be reached in a NW direction. A nice area for Sea Fans. A very pretty dive site, an alternative to the Lucy. Along the edge of the reef there is the mast from the Lucy lying along it, starting at 10m and running down the edge to over 20m.Here you will find some quite playful seals. In 1999 we counted about 20 seals along these rocks. We had just dived the Lucy and a small party wanted to dive with the seals. We could see the seals coming up to the SMB`s and playing with them. The boat cleared of divers as they all dived in to swim on the surface. The seals were coming up to the divers and swimming between their legs, I have never seen anything like it! Lying on the Southern side of the Island, sheltered from the N, E, and NE winds. Depths down to 35m with some great drop offs, from 10m straight to 30m. A very spectacular dive site, with vertical walls. Plenty of Rose Coral covering the rocks. Crayfish and Dogfish abound. The bottom out to the west is at 40m plus. Currents can be fast, but a lovely place to explore.. Red Dead Mans fingers often seen, and some very large Lobsters. 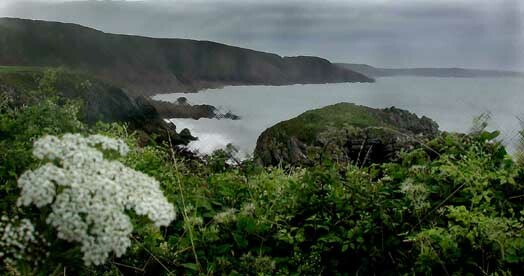 The area is protected, as its part of the Skomer reserve. Lies to the west of Skomer Island, an interesting dive making a good second dive if diving the Garland Stone or Pains Rock. Slack is 3-5 hours after HW. North from the rock just outside the cutting in the rocks called the Bull Hole, lies a wall that drops from 8m down to over 20m. Here are some lovely Fan corals as well as plenty of lobsters. Well sheltered from the East winds. 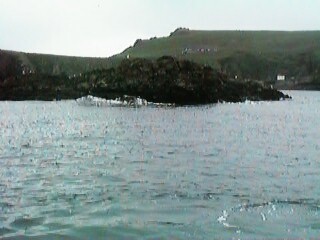 South of Skomer Island, a reef covered in yellow sponges, very pretty. Reef runs out at 12 metres and drops to 25 metres at the end of it. The bottom is sand which is covered in life. Excellent dive with drop offs to over 30 metres. The reef runs out east to west from the Island and can be seen at low water springs. Care to be taken when there is a large sea swell, as it could make picking up difficuilt. An excellent dive site with depths around 15 metres dropping to over 20 off the rock. The wall of the rock is covered with life and an area where you will find Cray fish. Best dived on low water slack. Area is not far from Jack Sound, so take care, the waters can be very rough around this area. Best pick calm waters and no wind. Nice reef running from mainland. Depth 5 - 20m Launch Little Haven / Broad Haven. 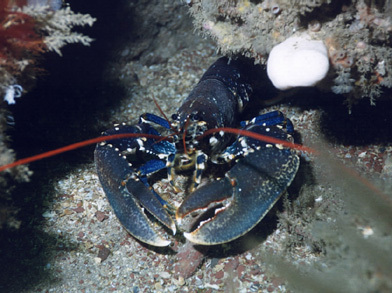 Some large lobsters have been seen in some caves. West of the Island, which is only an Island at high tide, runs a reef NW to SE. Drop in north of the Island when the drift is to the south, drift the other way and you need to be careful, as you could run into Jack Sound. A wonderful amount of life can be seen. Octopus, Wrasse, Rose Corals white and brown. Launch out of Dale or Martins Haven. Depth is around 20m. Best time to dive here is 2 hours before LW Milford Haven as the current flows southwards. A garden of wonder with amazing colours to be seen everywhere you look. Lobsters, Spider Crabs, Edible Crabs, Dogfish, Peacock Worms, Elephants Sponge, Yellow Borney Sponge, Branching Sponge, Spiny Starfish, Leopard Spotted Goby, Sea Cucumber Pollack, Rose Coral, Sponges ranging in many colours the size of footballs and the list goes on. The depth is about 15 to 20 meters., and there is usually a drift southwards if you dive her at about one hour before LW Milford Haven. Lobster photo by Jason Gregory. An area of amazing marine life, covered in Sea Urchins, Sponges and Dof Fish. There are gullies and walls all over the reef and very difficult to plan out. On the south side it drops to 30 metres but most of the reef is at 15 metres. In one hole I saw a Crawfish which was 3 feet long! I left him alone and I hope others that dive this site do too, he wont be brought up on any of our boats. A reef half way between Grassholmn and the Smalls, which has a wall that drops to 50 metres. Slack water about 2 hours before HW Milford, as the north flow starts 1 1/2 hours before HW. Rock comes to the surface about 3 metres at LW and the reef runs to the south of the rock. Here you might sea some sharks, such as the Mako, Thresher and even Basking. 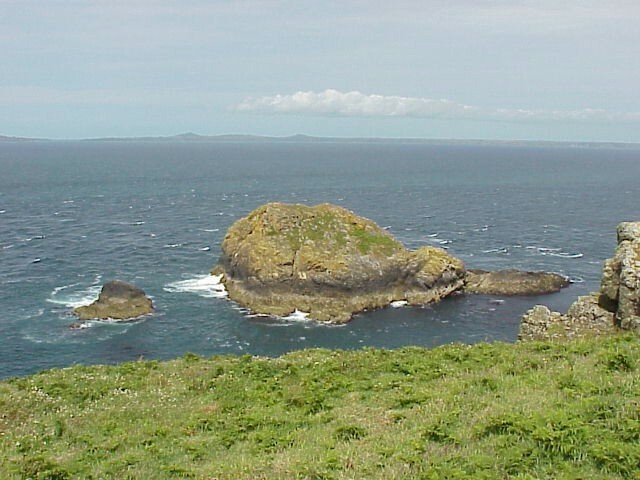 An Island 12 miles out west from Skomer, where there is a Gannet colony. Slack is 2 hours before HW Milford. The north flow start one and half hous before and the south flow four and a half hours after. Large area of rocks between shipping channels. Keep to the SE of the post. Depth 25m. This is also the main shipping lane into the haven, so care must be taken. Tides are also strong, so care must be taken, as it is easy to drift into the shipping lanes. Slack is at HW and LW Milford haven. 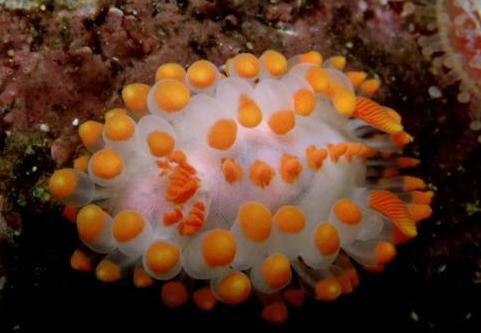 If you are into Nudibranch then this is the site for you. We spotted hundreds of them and many different species and thousands of eggs. A wall dive dropping from 10 metres to 17 metres with lots of gullies. There were some very large edible crabs and lobsters which we left there. Yellow and elephant sponges covered the wall. A great second dive, ideal for photography and a very pretty site. Shore based dive overlooking Stack rocks, access being difficult. A farm track leads to a farm yard where you will pass a few houses. Ask the farmer for permission to drive through, and park your vehicle at the farm gate at the end of the track. Here you can get kited up and make the short walk down to the small pebbly beach. Some large rocks at the bottom and plenty to explore. Home for hundreds of spider crabs in the kelp. Around to the right there are some interesting gullies. Depths are around 10 meters. Runs out from Watwick Bay. 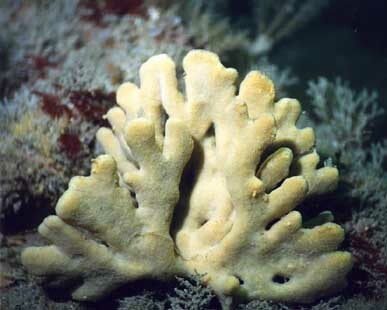 A small reef containing some varied marine life. Depths 20m The bay itself is sandy and secluded from most winds and looks out towards the English coast. Boats can be pulled up onto the beach which makes an ideal picnic spot. The reefs lie in patches across the sands. Trigger fish have been seen here for the first time in 1999. On the reef some Eagle Rays were seen at about 15 metres and stayed long enough to be touched and stroked. On the SE corner of the Island, sheltered from westerly winds is a small cove where there are plenty of seals. Not deep, around 8-10 meters. Needle Rocks on the SE side of the Island there is a colony of seals, in a sheltered cove. Depth about 6m this makes a good second dive if diving these parts. A remains of a wreck can be found in some interesting gullies. To dive with the seals you need to stay still at the bottom and wait for them to come to you. Sheltered from the winds from the W NW N and NE.Another good place to dive is where the landing station is. On the far side where the rocks come out from the shore you will find a few wrecks. The first one is called the Alice Williams, the second we are not sure. Drop in by the rocks and swim towards seal bay, you will pass the two wrecks. There are also some interesting gullies and marine life to be found. Along side the lighthouse the cliffs are quite steep, well sheltered from the N & NE wind. The wall drops to 30 m. The current can be quite strong, and makes a good drift dive if flowing eastwards. A wreck lies here, called The Bury, there is an anchor, and a prop, the area is strewn with bricks, which must have been the ballast. What looks like a cabin lies clear of the gully in which the prop lies. To locate the wreck, drop in to the right of the lighthouse about 30 feet from the cliffs, and drift eastwards. The wall is covered with wreckage from at least two wrecks. The Mari reef is one of the best reef dives we have found, it starts at 8 metres and drops to over 30 metres, with caves and hundreds of gullies to explore. It is ten times better than Stack Rocks and about four times as big, better than the North Wall and Junkos Rock. We saw stuff that we have not seen on other reefs, Nudibranches, Blennies, Dog Fish, Conger Eels, Sea Squirts, like the Aplidium punctum, Peacock Worms, many different kinds of Star Fish such as the Bloody Henry, hundreds of Sea Urchins, Dead Mans Fingers, Sea Fans, Lobsters, Sponges, Cotton spinner, Fan Worms, Compass jellyfish, Moon jellyfish, Sea beard, Burrowing anemone, Devonshire cup coral, Jewel anemone, Sea orange, Axinella dissimilis, Breadcrumb sponge, Elephant sponge, and the beautiful Actinothoe sphyrodeta, a white anemone. What a great dive, vis was 15 metres and we drifted over the reef at the end of our dive and just looked down on it with amazement. Position only known to Dive Pembrokeshire. 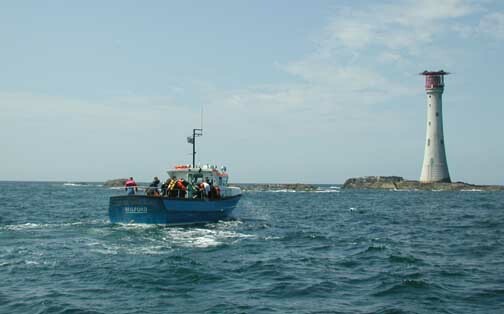 A shallow area east of Skokholm where a cannon was seen at 20 meters., the exact location is not known, as the divers who seen it have tried many times to find it without luck. 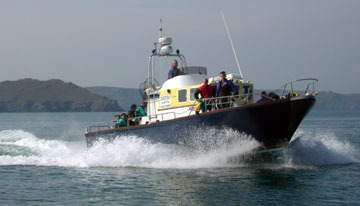 Dive Pembrokeshire will explore the area on the mid week Safari breaks, details of which are found on their home page. A rock face that drops to over 40 metres. A neap tide dive only. A wonderful area to dive. Here you will find Cuttlefish, Squat lobsters, Conger eels, Octopus and many fish. Dive only on neap tides and at slack water. 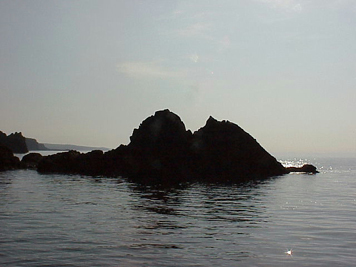 A group of rocks between Grassholmn and The Smalls where their is some of the ebst diving to be found along the coastline of Pembrokeshire. Here there is clearer water and drop offs down to 30 metres plus. A good chance of seeing some larger marine life around this area. Takes about an hour to get to in small inflatable. Should only be attempted when conditions are perfect. Slack water at the Smalls is 1 hour before H.W. 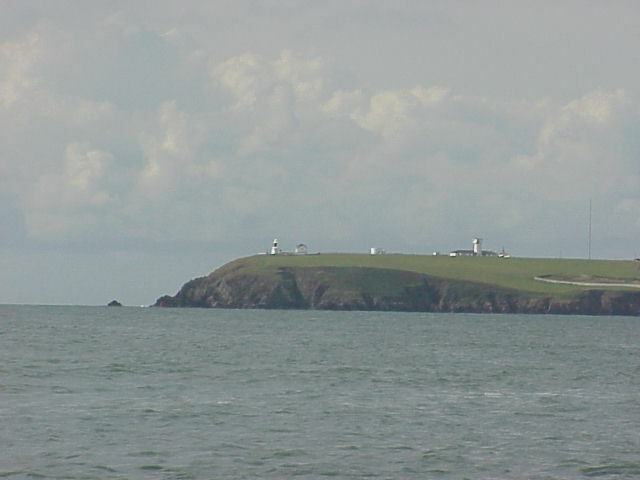 Milford Haven and 5 hours after H.W. Milford Haven. The area is famous for its marine life, including its Seals. Her they are tame enough to come right up to you and tend to play with your fins. 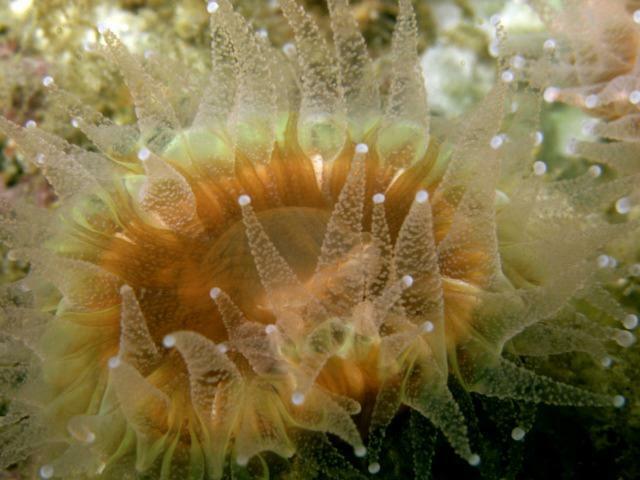 The visibility is always very good, with a varied marine life, properly the best in then area. The area is not very often dived, and a lot of it is still virgin country. 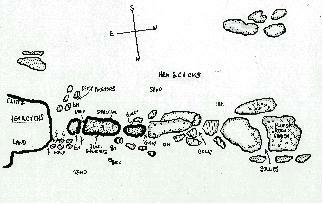 There are many wrecks scattered around the cluster of islands, some undiscovered yet. The Cambro wreck lies 150 meters. due east of the Smalls lighthouse at a depth of 22m is one of the many wrecks in this area. ( See wreck section) There is a restricted area at 51 43¬18"N 05 40`29"W, where an old Viking Sword was found, a Hiberno-Norse sword guard, dating to about AD1100 discovered by a sports diver in 1991. The restriction is 100m around the site. The Smalls are also known for its seals, as they are lie all around the rocks. They are quite tame, not seeing many people, they become quite inquisitive and will follow you around under the water and play with your fins. You need to stay still in the water and wait for them to come up to you. They get so close you are even able to stroke them. There are areas between the rocks where between dives you can snorkel. Swimming between some of them you will be able to see the seals along the bottom looking up at you. An area where there are numerous wrecks, and worth exploring. Depths around the 20m mark. Currents can be strong. Well sheltered from N NE winds. An old anchor lies just inside the head from an unknown wreck. Some nice gullies lies behind the large rock island, just under the lighthouse. The coastline around the corner towards Highpoint is very interesting. A number of wrecks are dotted along this coastline, and are worth exploring. Would be best dived when the wind is N or NE.Tides can be fast away from the cliffs. When there is a large swell the overfalls around the heads can be large, so care must be taken if taking the boat around from Dale. Lies just past Linney Head. Contains a few wrecks, one to the East side of the rock. There are many overfalls in the area, as the bottom is very rocky. Good place for Crayfish. Many gullies worth exploring, and plenty of wreckage to be found. There are many gullies that are home to torpedoes and unexploded shells. Slack 2 hrs after LW and 2hrs after HW. Needs to be times correctly, and currents can reach up to 6 kts. There are lots of wrecks down below, and makes a good drift dive, but not for the faint hearted. I observed that 3 hours after LW the tidal flow started to flow, this was a neap tide. Make sure if you do dive here, that you wait for the tide stop, have one boat for every two divers, use SMB`s, choose only neap tides and MOST important make sure the flow is going SOUTH after the slack has changed. A good shore dive well sheltered from north and westerly winds. Go out past the harbour wall which forms a small channel as you go out. Follow the rocks around to your left, depths are about 8 metres and there is plenty to see, such as large spider crabs and lobsters. A firing range operates around Linney head. Not normally operational at weekends, from Fri. 16.30 until Monday 0900. Check with the coastguard first. The area will be patrolled when in use.